(Newser) – An American Airlines flight from Los Angeles to Honolulu was escorted by two F-22 fighter jets Friday after a passenger tried to get into the cockpit, ABC News reports. American Airlines characterizes it as a "disturbance." A source at the TSA says a passenger with a laptop was waiting for the bathroom near the cockpit when a flight attendant told him to sit down. According to Bloomberg, the passenger set the laptop down next to the cockpit door. And Hawaii News Now reports he tried to open the cockpit door. 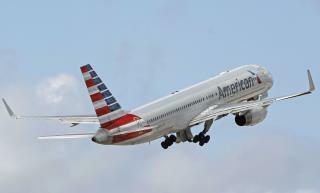 The passenger was restrained by fellow fliers, including an off-duty Honolulu police officer. After his first attempt to get through a security door at the airport, he should have been barred from flying. After a stunt like that, the Israelis would never have let him board an aircraft. Good to hear that a Honolulu police officer was on board. Every flight ought to have at least one armed security officer on board. El Al flights do. Can you say "test run"?